A bone fracture means that your bone has broken. Bone fractures will happen if some force or pressure is exerted on bones that makes them break. As a result, broken bones generally occur through some type of accident, such as a fall or a vehicle crash. Bone fractures are most common in children and in older adults. In an older adult, bone fractures can happen more easily and take a very long time to heal, as their bones may be more brittle than the bones of younger people. Bone fractures can occur in any bone in the body: the foot, the leg or arms, and the ankle, in addition to the rib, hip, shoulder, clavicle, and other bones. Bone fractures are a medical emergency. It is not always apparent when you have broken a bone. You may feel pain, but attribute it to a blow from a traumatic event such as a car crash and not realize that it is a bone fracture. Untreated bone fractures can result in permanent loss of mobility, infection of the bone, other parts of the body or the wound, and extreme pain. Depending on the break, a bone fracture can also damage surrounding areas of the body, such as the nerves and blood vessels. The severity of the injury depends on which bone is broken, surrounding damage, and what parts of the body are affected. There are several different types of bone fractures. Some of them, such as displaced versus non-displaced types, refer to how the bone breaks. Others, such as closed versus open, refers to how the bone interacts with the rest of the body. A nondisplaced bone fracture means that the bone does not move and still has the correct alignment, whether it has broken part of the way or completely through. If a bone breaks and causes an open wound or goes through the skin, it is termed an open fracture. These are also called compound fractures. Open fractures may break through the skin but then go back into the wound and be invisible. Open fractures can be more dangerous because they have a higher risk of infection. Deep bone infection, called osteomyelitis, can be especially serious, and even life-threatening. It may require lengthy treatment. In a closed fracture, there will be no break through the skin or open wound. If you or a loved one has a bone fracture due to the negligent action of another, it might be possible to bring a lawsuit under Louisiana’s personal injury laws. Generally, a person or organization can be charged with negligence if they knew or should have known that a situation for which they were responsible was dangerous, but did not take reasonable care to avoid it, eliminate it, or fix it. If, for example, you rented an apartment and the outside stairs had been rickety for over a year, your landlord or a property manager could be liable for a slip and fall from those stairs that resulted in a bone fracture. A damage claim can be brought for medical bills, physical therapy bills, loss of wages if the injury caused you to lose work time, prescription medications, and more. Settlement amounts vary depending on the nature of the bone fracture and the amount of impairment and damages it caused. In general, if a bone fracture caused significant medical treatment and physical therapy, damages can be sought. If a bone fracture also causes significant loss of wages, or heals in such a way that the affected person’s ability to perform a past job is impaired, damages can compensate the patient. If, for example, a person’s job required standing and a broken foot made that impossible for two months, the person can be compensated for lost wages. If the injury is such, or treated in such a way, that they will never be able to perform that job again, they can be compensated for disability. Broken Foot: Depending on the case and how much medical treatment was required, broken foot damages can range from $2,500.00 to over $100,000.00. Broken Leg: Across the country, the median compensation awarded by courts for broken legs is $141,847. Broken Arm: A slip and fall accident causing a broken arm recently resulted in damages of $197,500. Broken Ankle: Awards can be as high, as $203,000 was recently awarded to a plaintiff who had nerve and subcutaneous damage to an ankle and foot, which caused permanent partial disability as well as scarring and mental distress. If you or a loved one has experienced a bone fracture due to an accident or vehicle crash, a seasoned bone injury lawyer can help. 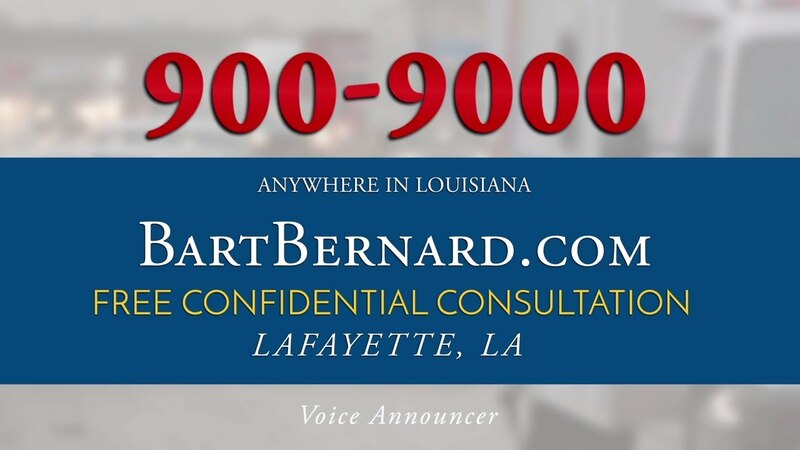 For your convenience, Bart Bernard Injury Lawyers has offices in both Baton Rouge and Lafayette, Louisiana. We assist both people who are long-time residents of our communities and out-of-state residents who need advice on Louisiana law. Our initial consultation on your case is offered at no cost to you. Call or contact me online today.